The University of California, Santa Barbara takes safety seriously, and takes a proactive approach to emergency planning. We all face these risks, and we all share responsibility for preparedness. 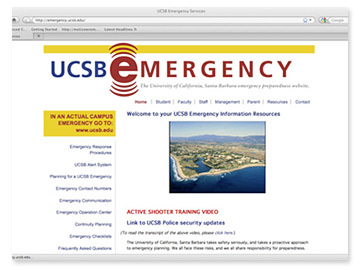 The UCSB Emergency Preparedness website was developed to assist students, parents, faculty and staff to become familiar with the campus response procedures and plans already in place in preparing for future emergencies. Emergency preparedness is everyone’s responsibility. Cowan Communication Arts worked with the Associate Vice Chancellor Ron Cortez and UCSB Environmental Health and Safety to develop and design the UCSB Emergency Preparedness identity and website. Web design associate Jennifer LeMay worked closely with CCA to develop the website.